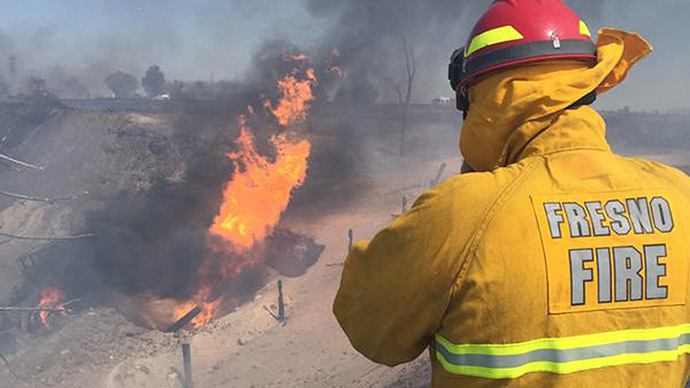 A huge gas pipeline line explosion at the Fresno County Sheriff's gun range, where a construction crew that included jail inmates was using heavy machinery, has injured 15 people, sending a 60 meter tall fireball in the air. Authorities are still trying to determine what exactly caused the explosion in the central Californian town, but it is known that a jail inmate work crew has been doing some construction work with heavy machinery at the site. Witnesses said they saw flames shooting up about 200 feet. Workers could have hit a Pacific Gas & Electric Co. pipe carrying natural gas, causing the accident, said Tony Botti, a spokesman for the Fresno County Sheriff's Office. No law enforcement officers were injured, Botti added. Medical authorities informed the press that four patients are being treated at Community Regional Medical Centers, three of whom are in a critical condition. One was admitted in a serious condition to the burn and trauma unit, spokeswoman Mary Lisa Russell said. Four other patients are being treated at St. Agnes Hospital while three more are recovering in Madera Community Hospital. Another four victims suffered minor injuries and were treated and released at the scene, Fresno County Medical Services director Dan Lynch said. A total of 11 inmates were injured, with 3 inmates taken back to Fresno County Jail as they were never hospitalized, the Sheriff’s office said. According to Sheriff Margaret Mims, country workers and inmate crews typically work at the shooting range building berms and doing basic maintenance. The Fire Department confirmed that a 12-inch diameter pipeline belonging to PG&E was ruptured in the accident when a front loader was working the site, however it remains unclear whether the vehicle was digging before the explosion. The operator of the heavy machinery was flown by helicopter to a hospital in serious condition, the Fire Department said. “We do not have definitive information,” PG&E stated as the company expressed condolences to those injured. PG&E crews turned off the gas line and fire crews were able to quickly put out the flames. No homes in the area were evacuated because of the explosion. Meanwhile a major travel artery in California, Highway 99 was forced to close for three hours in both directions according to the California Highway Patrol as of 2:30 pm local time. A nearby rail service was also halted out of concern that a passing train could spark leaking gas.